Settling for average is simply not good enough. Where is your head at and why do you think you will ever achieve success if you’re a small thinker? 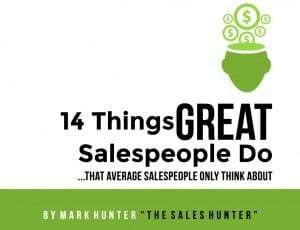 Recently I wrote 14 Things Great Salespeople Do and I’m pleased to say it’s now in an ebook you and every other salesperson you know must read. Why? Simply put, we have to eliminate small thinking. Small thinking is destroying far too many salespeople. Every week I get calls from salespeople who are complaining about their lack of success and ability to get ahead. I want to address this because I truly believe settling for average is simply not good enough. Why should anyone settle for average? The reason people are comfortable settling for average is because they have allowed themselves to think small. Recently I was sitting in a Starbucks — yes, my favorite place to hold one-on-one meetings talking with a salesperson about my goals. I was sharing my own success and then stating how I was determined to drive it forward 10 fold. The person looked perplexed because in this person’s mind, the numbers I was already achieving were already good enough for them. All I keep thinking, though, is why would I want to settle for what I already have? Why settle for less than what is possible? Success goes not to those who accept average. Nope. Success goes to those who continue to push and excel. Where is your thinking? Are you thinking small? Are you thinking average is just fine? When we push ourselves, it’s amazing what we uncover about what we are capable of doing. Once we uncover new things we’re capable of doing, it’s amazing how suddenly we reach a new level of success. Your goal is to do two things. First, challenge your thinking and ask yourself in what areas are you willing to settle for average or thinking small. Second, grab a copy of my ebook 14 Things Great Salespeople Do that Average Salespeople Only Think About. Life’s too short to think small or to be average… when you have the potential to dream big and be great! PrevPreviousPresenting Multiple Offers: Is This a Good Strategy? Give credit where credit is due: Grand Cardone.